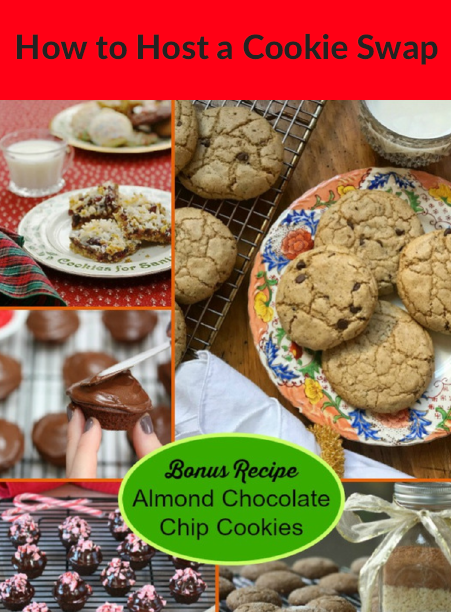 It's cookie swap season, so let's celebrate together with this how-to for hosting a cookie swap (AKA, cookie exchange), tips for adding a dash of good health to your holiday treats, and a sensational recipe for Almond Chocolate Chip Cookies. These cookies are one of my swap favorites. Made with better-for-you ingredients like whole wheat flour, ground flaxseed, almond butter, eggs, organic canola oil, and a handful of mini semi-sweet chocolate chip, I hope you and your friends love them as much as we do around my house!